On January 1st, 2007 a yard waste ban was instituted in New Castle County. This means that all yard waste will not be allowed in your trash pickups. Some of our customers have asked us a couple of very important questions. First, how will this ban affect you and our ability to provide the quality of service at a reasonable price that you have come to expect? Well, it will not affect you and it does not affect us. The reason goes with the second question. Do we recycle or do we have plans to recycle? As customers of Brandywine Nurseries you have been part of the oldest and largest private yard waste recycling program in the State. For 20 years we have recycled all of our yard waste and debris from all of our projects. In fact in 1998 we were recognized by the State of Delaware for our commitment to waste reduction, reuse and recycling. 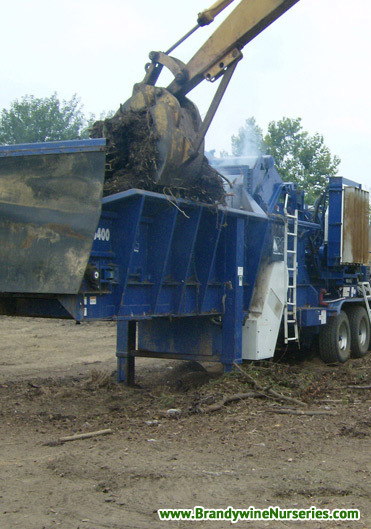 All the debris from the work we do on your property is brought to our facility where it is separated and processed into other products. For example the leaves, grass clippings and trimmings are ground up and composted. Then they are processed into planting mix or topsoil. We at Brandywine Nurseries recognize our responsibility to be environmentally responsible. We do this by establishing operating procedures and providing products and services that integrate aesthetic considerations with respect for the environment.